A POET, SONGWRITER AND LEGEND. 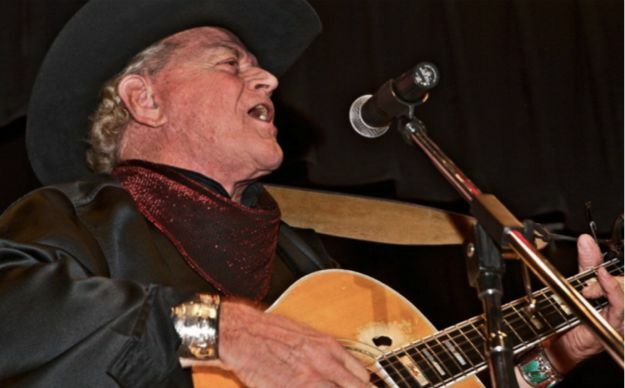 ​​After more than 50 years as Arizona’s Official State Balladeer, Dolan Ellis still hangs his professional hat on the title that first came to him in February 1966, as an appointment by Governor Sam Goddard that has now been endorsed by thirteen consecutive governors. Many well-deserved awards have come to Dolan Ellis over the years: a Grammy, gold records, the Arizona Tourism Hall of Fame. Senator John McCain read Dolan and his music into the Congressional Record. He was the first to be inducted as an Arizona Culture Keeper. The lyrics are true. Dolan Ellis is a very talented poet and tunesmith who could have directed his efforts toward the commercial market. Instead, he chose to write about, sing about, and teach us, Arizonans and visitors alike, about the state he loves. Dolan is not a native Arizonan. He was born and raised in Kansas, and never even visited Arizona until he moved to Phoenix in 1959. And yet, that move seemed like a homecoming to the young man who had loved the Western movies, especially those featuring the “singin’ cowboys.” He fantasized that all of the movies depicted life in Arizona. Dolan knew that Arizona, with its wide-open spaces, was the place he ought to be. In Phoenix, Dolan spent some time in the television industry while he worked at a great little coffee house in Scottsdale called Portofino ’s. He soon quit the television job and became the house act, opening for and learning from the best of the era’s folk artists. Gigs at Portofino ’s and other “happening” coffee houses throughout the West provided an opportunity for his music to be noticed at the national level. When Randy Sparks was recruiting solo artists and small groups to become part of the New Christy Minstrels, Dolan was a natural fit, with his great baritone voice and 12-string guitar, his enthusiasm, and his clean-cut good looks. By 1963, the Christies were at the top, with a Grammy for best group, five albums including some that were gold, 39 consecutive weeks on the nationally televised Andy Williams show, and appearances at the best concert venues in the nation. That was when the future Arizona Balladeer left the group to move back to his beloved, adopted state and once again explore its back roads, canyons, and mountains—and meet its unique people. Upon leaving the Christies, Dolan wrote another autobiographical song, “Goin’ Home to Springerville.” Springerville, a real but very small town in the Whtie Mountains of Eastern Arizona, was a metaphor for Scottsdale and Phoenix, which at that time still had the small town feeling. He wrote it on the airplane back to Phoenix, after they finished an engagement in Lake Tahoe. Dolan had just made a huge decision, and the song lyrics and bluesy sound seemed to echo his feelings. More than 55 years and 300 songs later, Dolan Ellis is still going strong. In 1996, he began performing at the non-profit, 501c3, Arizona Folklore Preserve, which he founded in Ramsey Canyon south of Sierra Vista. It had taken more than five years to restore the property and go through all the necessary legal steps. Now the Preserve is under the ownership of the University of Arizona South and operated by the AFP Board of Directors. The Balladeer remains Artist-in-Residence and appears there one weekend each month, presenting different shows based on the seasons of the year and holidays and such. On other weekends, he books the best of Arizona cultural and folk artists to appear at the rustic stage in the Preserve’s theater, which Dolan designed specifically for presentation of acoustic music. Dolan proudly keeps track of the number of folk artists who have appeared on his stage–a number that has now exceeded 200. Regular customers of the AFP have learned to trust Dolan in his choice of guest artists. They know any show that Dolan books is going to be highly entertaining. Until very recently, Dolan’s appearances with the New Christy Minstrels® were rare. A major reunion in Queen Creek, Arizona, in April 2005 changed everything. After that, the group got together several more times. Now they have a regular touring group consisting of Randy Sparks, Pete Henderson, Eddie Boggs, and some newer members: Becky Jo Benson, Jennifer Lind, Greg O’Haver and Dave Deutschendorf. Another newer member, Chuck Cole, joins them occasionally. They’ve already done several tours. Their schedule is available on the NCM site. The Balladeer takes his own one-man show on the road throughout the state and sometimes beyond, for formal concerts, conventions, cowboy poetry and music gatherings, folk and storytelling festivals, private parties, and occasional benefit performances. His shows consist mostly of his own songs about Arizona people, places, and things. At the Arizona Folklore Preserve and at other venues on demand, he uses large screen photography, mostly his own and occasionally historic, to illustrate the songs. His baritone voice is better than ever, with an almost unbelievable resonance, and his 12-string guitar adds a special dimension to the music. Dolan connects with his audiences as few performers can do, relying on his humor and storytelling skills to enhance his considerable musical talent.